B2C (Business-to-Consumer) mobile apps are specifically designed to help businesses in being in touch with their customers and serving them in a better way. As Smartphone’s are used by a large number of customers, there are immense opportunities for enterprises to utilize B2C mobile apps to engage with customers and attract prospects. B2C mobile apps narrow the gap between customers and enterprises and allow clients to call customer services, get in touch with enterprises through one-touch applications, send email or message easily and reach their stores through GPS enabled directions. 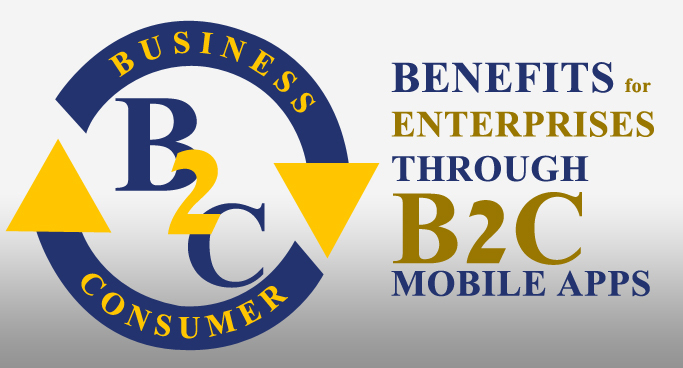 We have outlined the five key benefits that enterprises can avail by using B2C mobile apps. Enterprises use mobile apps for better communication and engagement with their existing as well as potential customers. B2C mobile apps are an effective tool for marketing and promotion, creating brand awareness and improving visibility on app stores and social media sites. It is also possible to carry out email marketing campaigns like sending newsletter or mailers, by easily importing contacts that are gathered from the mobile app. Enterprises can even send push notifications to customer for newly launched products, added services, discounts & offers and much more. Mobile apps are in great demand due to rising use of Smartphone’s. Enterprises can use this opportunity to increase their visibility among users. Customers will visit your website only when they will search for their requirements on Search Engines. A mobile app icon will keep them reminding of you. In future when they’ll want to purchase something they will consider opening your app before downloading any new app or trying to find products and services on Search Engines. Mobile apps are very effective in maintaining long lasting relations with the existing clients. You can keep your clients informed about your latest launches, offer special discounts to your regular customers and give them free coupons and vouchers on purchases made by them. You can even notify them about special events and launches of your enterprise. Your customers can give instant feedback of your products through a mobile app. B2C mobile apps play a vital role in keeping you connected with your customers. These apps are a win-win situation for you as well as your clients as your loyal customers can help you to take your business viral through social media platforms. Large number of enterprises already has a B2C mobile app to facilitate customer service. Customers now expect businesses to give them an enhanced experience through mobile apps. If you will not be able to cater to this requirement, you might lose many potential customers to your competitors. And no enterprise will like to fall into such a situation! By having a B2C mobile app, you will be able to give a tough competition to your rivals. And through a proper market strategy, you might even be able to attract some of their customers. An enterprise mobile app built to cater to B2C segment, assist businesses in keeping in touch with their clients at any point of time. It becomes convenient for your customers to call you with just one touch from inside your mobile app. You can respond to their queries quickly and offer instant solutions, leading to an improved customer service. B2C apps thus increase accessibility, allowing you to engage with your customers in real time and be more responsive. Mobile apps have revolutionized the way enterprises interact with their clients; bringing unparalleled flexibility in the communication process. Whether it is about delighting your customers or improving visibility and customer service; B2C mobile apps can benefit enterprises in numerous ways. In the end, it is important to understand that the trend of mobile apps doesn’t seem to end anytime soon! Then why don’t to seize this opportunity and promote your enterprise through this powerful tool! Semaphore Software is a leading enterprise mobile app development company; with the proficiency in creating a user experience to suit any enterprise need. Contact us through info@semaphore-software.com to get in touch with our developers for customized, robust enterprise mobile apps to stay connected to your customers! !